Since the late 1960's, the Yosemite Mountaineering School & Guide Service has guided tens of thousands of climbers—from novices through experts. Our guides are the only ones authorized to lead and teach climbing at Yosemite National Park. They’re passionate climbers, patient teachers and know Yosemite's cliffs better than anyone. Every guide is a wilderness First Responder or holds a Wilderness EMT certification. Reservations are recommended. Call the Mountaineering School to reserve your place 209.372.8344 or email us at yms@aramark.com. 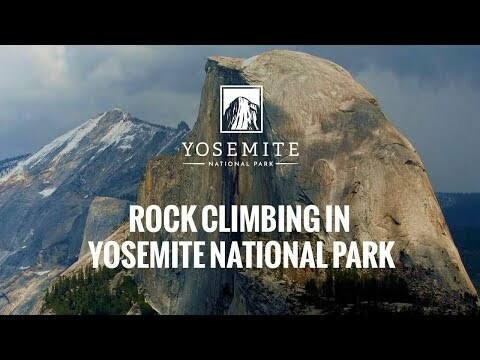 Climbing classes are generally seven and a half hours long and meet daily at 8:30 am at the Mountaineering School in Half Dome Village or in Tuolumne Meadows. Classes are designed to be taken sequentially and guides recommend a multi-day approach: with each class building upon what was learned the day before. Class size is limited to six students per instructor, and the minimum age for a non-parental supervised climbing lessons is 12. Children 10 and 11 years old can join the regular classes with a supervising adult. Children under 10 can participate in a private lesson with an adult. Reservations are recommended for all classes—including custom classes and private lessons. Call 209.372.8344 to make your reservation or learn more. Designed for beginners, you'll learn the basics, as you begin climbing and rappelling at heights up to 60 feet. Our expert guides make it a fun and memorable experience, with safety as the first priority. Maximum class size is six students per instructor. The second class in our series focuses on different climbing techniques, expanding on what you learned in the first class. You’ll learn the basics of crack climbing, protection techniques and simple anchors. Throughout the day, you'll be climbing and rappelling under the watchful eye of our expert guides. If you've ever climbed in the climbing gym, this is a great transition to climbing in the outdoors. Maximum class size is six students per instructor. The third class in our series is essential for anyone who someday hopes to climb on their own. It's also excellent for helping you assess your partner's abilities and confidence. This intensive class focuses on anchoring techniques, covering top-rope and more advanced anchors. Anchoring is the most fundamental and essential skill for climbing safety. Class size is limited to six students per instructor. This advanced course will cover leading and multi-pitch climbing. Your expert instructor will teach you the techniques used to get the rope up and continue past one rope length. Once you learn to lead, you'll be the one responsible for orchestrating the pitch, protecting for the follower, aiding moves and leading strategies. It's critical that anyone who hopes to climb without an instructor takes this course. Maximum class size is six students per instructor. All rock climbers should take a self-rescue class, even if they've taken one before. If you ever plan to climb without a guide, you'll need to have mastered these techniques to keep you and your partner safe. Maximum class size is four students per instructor. Beginning & Intermediate: classes are based on 2 participants. We will combine individuals to form groups. Private rates apply if there are less than two participants on a given day. Advanced: classes are based on 3 participants. We will combine individuals to form groups. Private rates apply if there are less than three participants on a given day. All of our guided climbs are private lessons, taught by the professional guides from the Yosemite Mountaineering School. Whether this is your first time climbing or are a seasoned expert, you'll learn Yosemite-specific techniques to help you get more from your climbing experience—and stay safer. With ample time for one-on-one instruction, you'll learn as you climb. Reservations are suggested as far in advance as possible. Prices are based on the length of the climb in the number of climbers in your group. Reserve your guided climb by calling us at 209.372.8344. Take a guided tour with our spectacular rock climbing guides! The Yosemite Mountaineering School rents camping gear, climbing gear and backpacking equipment on a first-come first-served basis. No reservations are accepted. Call 209.372.8344 for more information. With advance notice, any visitors with special needs who want to experience climbing in Yosemite can be paired with a specially trained instructor who can accommodate most needs. A full payment (100%) deposit is required to book a reservation, except big wall climbs where a 50% deposit is required. If reservation is cancelled at least 14 days or more in advance of the scheduled activity, the full deposit will be refunded. For a cancellation of less than 14 days notice, deposit will be forfeited. For a no-show with no warning, the full deposit will be forfeited. Activities cancelled by YMS will be fully refunded. There will be no refunds due to weather or snow conditions. Once a climbing outing has started, the maximum refund is one half of that day’s fees. YMS will not accept reservations earlier than one year and one day before any YMS outing.